Are you in need of plans for the weekend? There’s still time to get tickets for the popular South Walton Beaches Wine & Food Festival, held from April 25th-28th. Make your way down to Grand Boulevard to experience one of Destin’s most exciting festivals. Don’t just take our word for it – USA Today called the South Walton Beaches Wine & Food Festival “One of the South’s standout food and beverage festivals.” Get your tickets for the festival here! The schedule is an action-packed four-day long weekend of fun. Wine World in Destin is hosting the kickoff event on the 25th from 5-7 PM, with the chance to meet winemakers and shakers from some of the top wineries in the world as well as great wine tastings. Friday, April 26th hosts the VIP Wine Festival events as well as the Craft Beer and Spirits Jam. If you are lucky enough to score a VIP ticket, you’ll enjoy entrance to all Friday, Saturday, and Sunday events. You’ll also receive a VIP swag bag with a festival gift, express entry to Saturday events, and priority reserved seating at tasting seminars. Buy VIP tickets here. Friday’s Craft Beer and Spirits Jam takes place from 6-9 PM, with the opportunity to sample beer and spirits from some of the most popular breweries and distilleries in the country. You’ll also get to meet the makers behind your favorite libations and enjoy great food on EATS street. Bring your dancing shoes, as you’ll be twirling around all night long to live music as well. Saturday the 27th and Sunday the 28th both host the Grand Tasting from 1-4 PM. If you can’t make it on Saturday, that’s what Sunday is for! 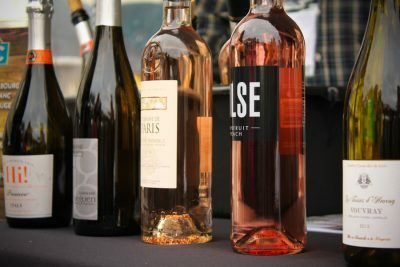 Over 800 wines are available here and your ticket includes Savor South Walton Culinary Village, Tasting Seminars, Rosé All Day Garden, Spirits Row and Nashville Songwriters Showcase. If you are attending the event and still in need of a place to stay, our lodging partners Southern Vacation Rentals have a variety of Destin vacation rentals that are nearby the festival. Tops’l Beach & Racquet Resort – Summit 311 is our pick for the South Walton Beaches Wine & Food Festival, as it is just minutes away from Grand Boulevard. This beautiful two-bedroom condo can sleep eight guests, so whether it’s just the two of you or you have a small group, everyone will be plenty comfortable. 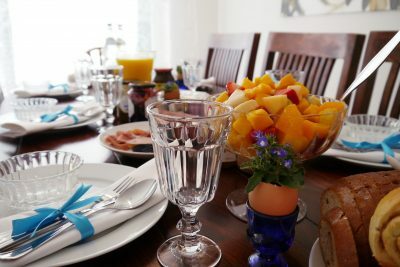 Posted on April 22, 2019 by Andie	in Homepage Featured Articles	Tagged April 2019, Destin Vacation Rentals, South Walton Beaches Wine & Food Festival, South Walton Wine Festival, Southern Vacation Rentals	Comments Off on Need Plans This Weekend? Spring is in the air, and the longer the sun is out, the more excited we are for the upcoming Summer season. Except for a little rain last night (but you know what they say about April showers), the skies have been clear and the weather has been warm. 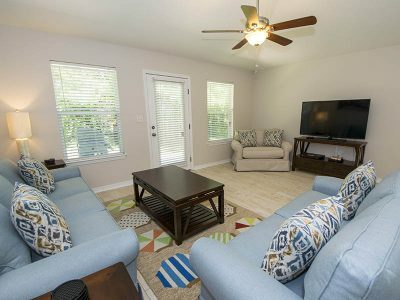 Not to mention, our lodging partners Southern Vacation Rentals have welcomed a new vacation home in Destin, Florida into their inventory just in time for Spring and Summer vacations. This five-bedroom home in Destin is perfect for the whole family since it can accommodate 16 guests! This home is called The Beach is Our Happy Place, and it certainly reminds us of how much we love the beach. Be among the first to stay here and plan your dream vacation. Let’s take a tour inside. 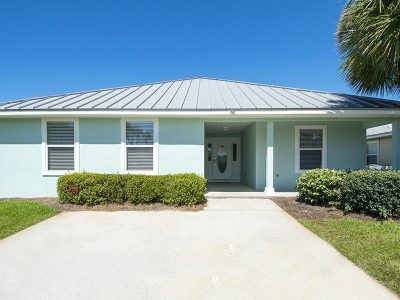 Right away, we love the bright blue exterior and the well-maintained front yard of this home. The inside is clean and comfortable, with ivory hardwood floors and decor with pops of blue and green. The open floor plan hosts the living room, dining area, and large kitchen. Inside the kitchen, you’ll notice granite countertops and stainless steel appliances that are perfect for preparing meals on your beach vacation. Since this home is a single story, all of the bedrooms are comfortably located on the one floor. The spacious second bedroom features a sleeper sofa as well as an en-suite bathroom with a dual granite vanity. The second and third bedrooms are connected by a Jack and Jill bathroom. 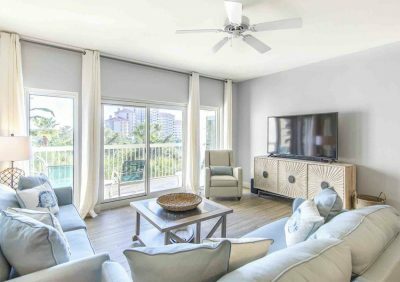 You’ll find this vacation home in Destin, Florida’s Maravilla community, with a range of amenities to make your vacation a breeze. A pool, fitness facility, tennis courts, and barbecue grill are yours to enjoy! Guests in Maravilla also enjoy private beach access, so just spread out your beach blanket grab a book, and soak up some sunshine!